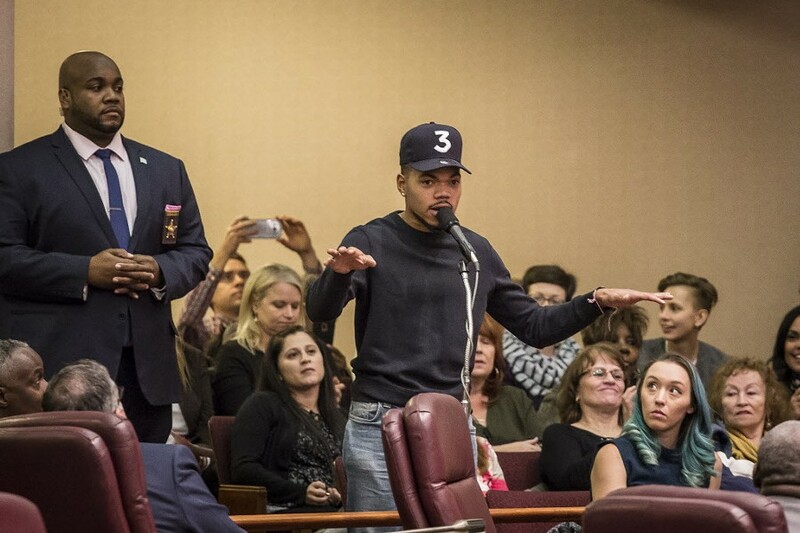 Chance the Rapper scolded aldermen over their spending priorities at the November 8 City Council hearing. 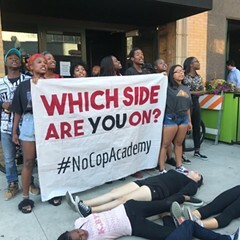 In the weeks leading up to the November 8 City Council vote that approved the $10 million purchase of a parcel of land for a new police and firefighter training academy, the organizers behind the #NoCopAcademy campaign stayed busy. Teens and adults from the campaign's coalition of 50 groups have led a push to prevent the city from spending a total of $95 million on the new state-of-the-art facility, which is planned for West Garfield Park; they've been canvassing, calling aldermen, and showing up to ward nights. By November 8 they'd collected more than 1,800 signatures opposing the plan. A day before the vote, they reached out to Chance the Rapper for his support—to their surprise, he showed up at the hearing, and during the public comment period he pleaded with aldermen not to approve the land purchase. Ultimately, the council voted 48 to 1 to approve the deal. The lone "no" came from 35th Ward alderman Carlos Ramirez-Rosa. This may seem like a defeat for the #NoCopAcademy campaign, but its leaders nevertheless say they feel they "won the day." Their takeaway from the experience, as well as aldermen's reflections on that vote, testify to the polarized meaning-making that animates local politics. The three organizers knew that several steps in the academy plan—the procurement of the funds for the land purchase, the land purchase itself, the approval of contractors to construct the facilities—would require the participation of City Council. 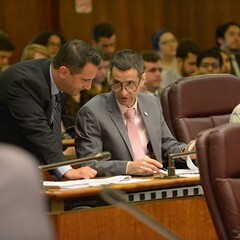 But they had little experience engaging with that legislative body or directly challenging aldermen on their agendas. They'd been close observers and supporters of the years-long effort to secure reparations for Jon Burge torture victims, and they'd mounted the #ByeAnita campaign to oust State's Attorney Anita Alvarez in the wake of the Laquan McDonald scandal, but spearheading #NoCopAcademy was a crash course in Chicago civics for May, Southorn, and Trinidad—and especially for the youth they work with. 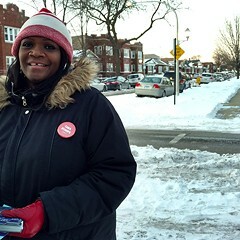 The organizers led five canvassing outings in Alderman Emma Mitts's 37th Ward, where construction of the academy is planned. "We went out and just talked to folks," May says. "We talked to people who live in proximity to Mitts, which is a lot of older people. We talked to people on the street, we called people, we talked to people of all ages—all black people, in her ward. Hundreds of them." The questions May and her crew asked included whether residents had heard about the academy plan (most hadn't) and whether they would agree to spend $95 million in the way the mayor is proposing. Given the choice between nothing and the police academy, some people said they'd take what they could get. However, May says organizers didn't find a single person who'd prefer to spend this money on the academy if it could go to other development in the neighborhood. 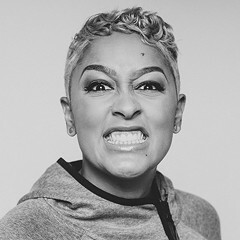 "The message from the hundreds of people we talked to is that money should be spent on things that directly support young people," she says. The most common suggestions were schools, after-school programs, job training, and a community center. The hearing was only three days away when the organizers heard about it, and that wasn't their only problem. "None of us had ever been to a committee meeting—we didn't know what to expect in the slightest," says Southorn. But even on such short notice they managed to bring a contingent of supporters to the hearing to testify against the deal. Their goal wasn't just to be heard speaking on the issue directly but also to get some of the more progressive aldermen on the 15-member committee to ask the same questions the #NoCopAcademy campaign is asking. It was a formidable challenge, because Mitts, who's championing the project, sits on the committee too. To their surprise, "[47th Ward alderman Ameya] Pawar and [33rd Ward alderman Deb] Mell both actually named some of our concerns," Southorn says. Still, it didn't come as a shock when the deal sailed through without a single dissenting vote. Two days later, on November 8, the land purchase went up for a vote in front of the full City Council. The campaign turned out with dozens of supporters and tried to sign up as many people as possible to make public comments. In the end, five people spoke against the project (including Chance), two spoke for it, and seven delivered remarks on other issues, including the shuttering of National Teachers Academy—a South Loop elementary school serving mostly black, low-income students. Kids from NTA have been packing City Council hearings for months to protest the closure of the school; this time they were escorted out of chambers for chanting "NTA is here to stay!" "The hearing itself was really fascinating to me," May says. She found it bitterly comical to see citizens given three minutes each to speak before the vote (capped at a total of 30 minutes) while aldermen were allotted three times that much time to make speeches to each other. Nonetheless, she was sure that public testimony against the police academy made an impression on city officials, because they spent a lot of time talking about the police in their remarks. "I think that they were scared," she says. "After they shut down public comments, they have 90 minutes of praising Chicago fire and Chicago police for their work . . . 90 minutes of 'Police are good, police are good, police are good.'" Had the decision about the land purchase happened immediately after the public comments, she thinks there could've been more "no" votes. "The whole hearing is designed to calm them down," she observes. The coalition members were thrilled to have at least Ramirez-Rosa on their side. After all, the activists point out, most aldermen vote with the mayor 70 to 100 percent of the time. "Going against Rahm—we understand that that is a threat to your political career," May says. "Who is a bigger threat to your political career: Rahm? Or this tiny group of young people with no money?" It turns out that May wasn't wrong that other aldermen were teetering on the brink of a "no" vote. One of them was 45th Ward alderman John Arena, and he says he knows of at least three others. Arena says he went along with the land purchase because he didn't think it was worth forsaking an opportunity to follow through with one of the DOJ's recommendations. He made it clear, however, that his ongoing support for the project would be contingent on progress in other areas of the police-reform agenda. "I wouldn't support moving forward with the facility unless we had the civilian oversight [of the police department] in place," Arena says. "We could use the land for something else, or we could sell it for a profit." Seventeenth Ward alderman David Moore also says he's sympathetic to the #NoCopAcademy message, but he wasn't going to vote against spending in a colleague's ward because he wouldn't want anyone voting against his plans to spend in his own—a stance known as "aldermanic prerogative." Like Arena, he thinks there are plenty of opportunities ahead to challenge the details of the facility (perhaps to make it cheaper) while still honoring federal and local reform recommendations. Moore says he'd spoken to #NoCopAcademy representatives at one of his ward nights, and he was heartened to see such intense civic engagement from young black people. 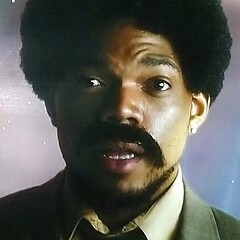 He thinks it was wrong of Emanuel to walk out when Chance was speaking. "It was disrespectful to our youth, who we constantly ask to get involved," he says. Ultimately, though, "It was an easy vote yes for me," Moore says. His biggest concern for the plan moving forward is that the academy could become a public-private asset, which would mean its operations might not be fully answerable to City Hall. "It should be all city-owned," he says—if it's not, he suggests, the academy would become a law-enforcement version of a charter school, which absorbs public money into an institution that's barely accountable to the public. Ramirez-Rosa isn't buying Moore's explanation for his vote, though. "I'll say that the argument of aldermanic prerogative doesn't hold up when you look at empirical evidence of the votes in City Council," he says. "When the mayor supports something, aldermanic prerogative flies out the window." He adds that while the development would be in Mitts's ward, its cost and impact would affect the entire city for generations. Ramirez-Rosa fully supports spending on community-oriented development in Mitts's ward, he says, but that's not what the academy would be. "There's no study that says if you build a new gleaming structure, [the police] will stop shooting black youth and mistreating civilians," he says. "What's required is real accountability and community oversight of the police." Ramirez-Rosa also points out that the city owns plenty of vacant land that could be used for a new facility, saving $10 million. The money for the land purchase is coming out of the nearly $90 million accrued by the Northwest Industrial Corridor TIF district, which spans the 37th Ward as well as the 36th, 31st, and 28th. If the political will existed, those millions could just as easily be spent building Chance's proposed swimming pool at Orr Academy, a CPS school located around the corner from the proposed academy site. The fact that this isn't happening leads Ramirez-Rosa to believe that Emanuel's real goal has nothing to do with community safety or the police. To the alderman this seems instead like a perfectly timed gentrification scheme. The mayor has been talking about building a new police academy since before his second inauguration, but the DOJ's notes about facilities provide a reason to push for it now. Ramirez-Rosa says that when the existing police academy at Jackson and Loomis was built some 40 years ago, that part of the near west side was seen as a "dangerous area." The way he sees it, "A big factor in gentrifying this area of the city was the placement of the police academy in that location." The same could be said of the existing fire-training facilities near UIC. "By combining the existing police and fire academies further west, the mayor frees up the existing academies to be sold to developers," Ramirez-Rosa says. "He then has an anchor on the far west side to begin gentrifying that area . . . to begin the wheel turning to displace poor black people from that area. [The new academy] will play the same role that [the old cacademy] played years ago." The organizers of #NoCopAcademy understand these dynamics. And though they're new to the financial acrobatics that go on in City Hall, they believe that their campaign could be an effective case in point to educate the public about how Chicago finds money to spend on certain things but not on others. "#NoCopAcademy is about: We're tired of this city having a blank check for police," says Southorn. May chimes in: "We're saying, No, we're done with this. You don't get more. You don't get almost 40 percent of the budget. You don't get $200 million in overtime—over your allocated budget. You don't get half a billion dollars in settlements, and then on top of that—almost a $100 million academy? No. Line in the sand. No more." The #NoCopAcademy campaign focuses as much on raising awareness about these inequitable spending priorities and encouraging citizens to engage with and understand local politics as it does trying to win specific votes. "We are changing the narrative too," says Trinidad. "[Emanuel] was trying to go under the radar with this 'public safety training center,' and a lot of the work we have done is changing the story." In the weeks following the vote, the Reader made multiple attempts to reach Mitts to discuss her perspective on the development and her thoughts about the #NoCopAcademy campaign. In the end she conceded only to make a written statement, emphasizing the academy as a precious development opportunity for her ward. The academy will "provide JOBS FOR LOCAL RESIDENTS and stimulate further ECONOMIC DEVELOPMENT," Mitts writes. "While some individuals, and activist groups are questioning/protesting this project . . . some are seemingly more committed to created [sic] uproar, media exposure, dissent and community confusion more than anything else. Let's try to work together, and not fall into the trap of opposing any or everything new that is proposed, designed to effect change and help the community. Protest without a clear plan rarely benefits anyone." The organizers scoff in response to claims by Mitts and others that they're being too aggressive and unrealistic with their demands or that they don't have a plan. "It's like Trumpism on an aldermanic level—it's just like crybabies who aren't used to civic engagement, aren't used to people saying 'No, you're doing it wrong,' so they're freaking out," May says. "We so often are being told that we're being too idealistic. But we're pragmatic in our vision, because it's rooted in a history and an understanding of how social change has happened. And it's never because an alderperson decides to do the right thing because it's the right thing to do. It's because it's the savvy thing for them to do. So our job is to build up power that threatens their ability to keep their job, and that's exactly what we've been doing. And that's exactly what we're gonna keep doing." The next City Council action related to the academy is slated for March. Can #AnybodyButMitts win in the 37th Ward? Incumbent alderman faces two challengers and a new hashtag. Was the police shooting of Harith Augustus justified? Is Blue Lives Matter for white cops only? 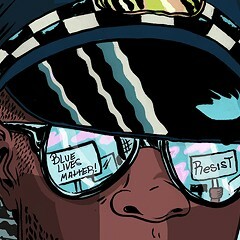 Three black Chicago-area officers talk about what things look like from where they stand.